There are two things I know for certain about my grandfather: that he fought in the Battle of Okinawa in World War Two, and that his favorite movie was "The Day the Earth Stood Still." The rest of his life is a bit murky, told in bits and pieces by my father, who drops small tales now and again, when he thinks nobody is really listening. Born in 1920, my grandfather hit adolescence as America hit rock bottom. The Depression was a difficult time for him, as it was for most working-class families, and with little opportunities, he signed up for the Marine Reserves at the age of 18, hoping for a chance at a better life. A year later, Adolf Hitler invaded Poland, and World War Two began. My grandfather was sent to the Pacific, where he engaged in several battles- most notably, The Battle of Iwo Jima, where he stood and watched the famous American flag raising scene that, to many, is the symbol of America's strength during World War Two. My father says he used to joke about it all the time- if only they'd said, "Charlie, come here, help us with this damn flag," he could have been in that famous photograph. Instead, he was on the ground, watching for movement in the distance, clutching his weapon to his chest and dodging the bullets that were taking out his fellow soldiers, his friends. He survived the Battle of Iwo Jima relatively unscathed; it was the next battle that almost killed him. During the Battle of Okinawa, from what I understand, my grandfather caught sight of a sniper hole and rushed it in order to take out the snipers and save his fellow soldiers. My father has never said if he was successful in this endeavor, but it is an unspoken understanding that he was. Nobody wants to say, "Your grandfather was brave enough to kill people." No father wants to tell his daughter that his own father had to take some lives, in order to save others. War is not a proud thing- the ends justify the means, but it doesn't make the means any easier to talk about. My grandfather's bravery cost him- he was shot from shoulder to hip and left for dead. When the battle had ended, an officer came by and kicked my grandfather's boot, to see if he was still alive. With all the strength he had, my grandfather waved his pinkie finger. 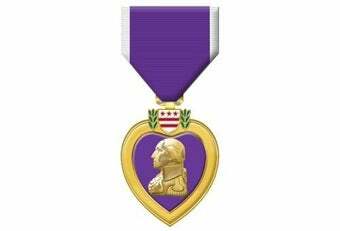 He was awarded the Purple Heart for bravery and sent back home to Massachusetts, where he married my grandmother and became a father to his only son, my dad, three years later. My father says that he can remember going to the doctor's office with my grandfather, ten years after the war had ended. The doctors would lift my grandfather's shirt and apply salve to the scar that crossed his entire torso. Shrapnel remained in his skin, a painful reminder of the horrors of war and its consequences. My father says that my grandfather never discussed the war. In pictures, you can see a distant look in his eye, a worried brow and a cigarette that remained in the corner of his mouth at all times. Though he died when I was only four years old, I can remember the way he spoke, his cigarette locked in his mouth, like John Wayne or Gary Cooper, stoic, silent, with eyes that gave both everything and nothing away. When my father told me that my grandfather's favorite movie was the original "The Day The Earth Stood Still", I felt a little pang of sadness in my heart- it's one of my favorite movies as well, and my father loves it too. My father and I are the antithesis of my grandfather- we are books, we are desks, we are typewriters. My father never fought in a war- just as his number came up for Vietnam, an opening in the National Guard came up as well. Fearful of appearing a coward, my father asked my grandfather for advice. "I didn't want him to be disappointed in me," my father says. My grandfather told him to take the Guard position. After all, he said, when he signed up for the Marines, he did so before the war had begun. He had no choice. "You have a choice not to go to war," my grandfather told my dad, "so take it." Memorial Day, I think, is one of those holidays that gets lost in a sea of parties and parades and extra days off from work. It is further compounded by a distaste for war, and the connection to military action that makes us feel angry and betrayed and misrepresented and cold. Many people (including some involved) have trouble separating the military from war itself, trouble separating a soldier from the orders he or she is asked to follow. My grandfather fought in a war that we were taught in school to celebrate, in battles that were immortalized in bronze. I suppose I should be proud of this fact, but there is a sadness attached to his War, to all wars, that does not elicit a response of pride as much as a desperate wish to eradicate the need for all such holidays, to understand the memories in the context we should understand them, to know that even a person who took a bullet from the enemy of the times never celebrated the end of all things, never talked about the days when the world was falling into darkness all around them, never displayed their Purple Heart, or even took it out of the box, for that matter. My grandfather made it back from war; he carried the war with him for the rest of his life. But many people do not make it back, and that is what Memorial Day is really about, that is the quieter side of Memorial Day that often gets brushed aside in favor of summer kickoffs and such. We are meant to pause, to remember, to think of the lives lost, the lessons we should be learning. "It is no concern of ours how you run your own planet, but if you threaten to extend your violence, this Earth of yours will be reduced to a burned-out cinder," Klaatu says in my grandfather's favorite film. The Purple Heart sits on my father's desk, next to the American Flag they gave my grandmother when my grandfather passed away. It is in its original case, where it sits next to a picture of my niece, my father's granddaughter, who is all eyes and teeth and unaware of the stories that sit in the box beside her.